I'm heading to the Your Weight Matters National Convention #YWM2016 this week. I am proud to be part of the Convention Planning Committee. I can't wait for everyone to experience the wonderful speakers and education in the agenda this year. I am fangirling over a few of the speakers. And my favorite part... the wonderful community, reconnecting with friends and making lots of new ones! I hope many of you will be in attendance. I will be taking part in the Event Welcome: Uniting Your Community to Inspire Health Friday morning, moderating a session called: Balancing Perspectives: A Look at Real Life Post-Bariatric Surgery later that day. I'm also hosting two lunch talks, Holidays and Celebrations: Tips for Staying on Track on Friday and Linking With Others: Finding Your Support System and Tools Online on Saturday. Sneak peek at some goodies I'm packing up for my table mates including the appropriately (since we're in peanut country) Celebrate Vitamins (sponsor & #YWM2016 exhibitor) Peanut Butter Protein 20 Protein Powder. If you are close... come! There's 3-day and single day on-site registration, health professionals can earn up to 16 CE units too if you need added justification ;) Oh and locals can get a FREE Pass for the Community Outreach Day Event on Saturday. They have access to some cool special programming, the health testing, the free samples and swag in the exhibit hall. See the link for more info and if you have a pal in the area tell them to come by. 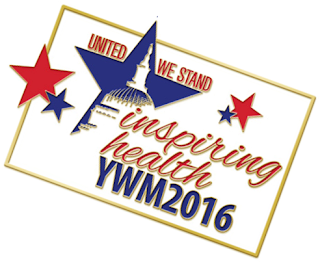 If you are not headed to #YWM2016 this year, please consider attending the event next year. Psst... the 2017 location will be announced Friday night at the costume party. Watch my twitter feed for the breaking news! It really is an event not to be missed. For me... it's a way to renew my commitment to my health. It energizes me and the inspiration and motivation carries me throughout the year. Well worth the price of admission! I wouldn't miss it for the world. The official hashtag is #YWM2016 if you'd like to follow that and be sure to follow the Obesity Action Coalition's (convention hosts) tweets too. 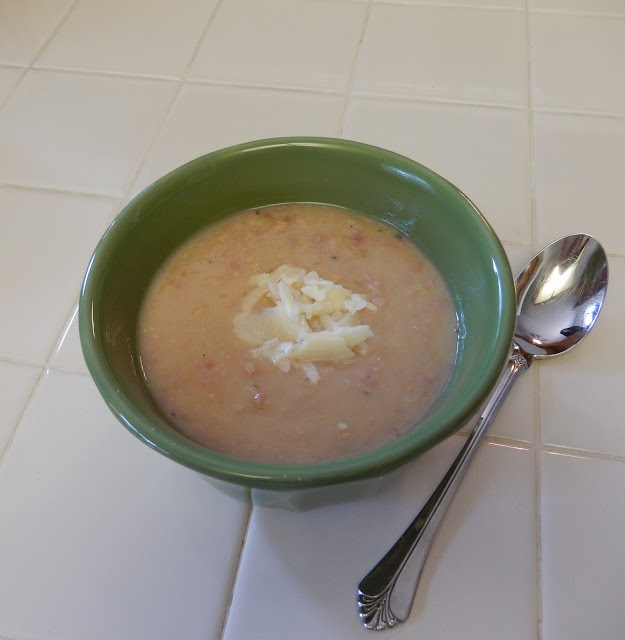 My take on one of the most famous soups in America. 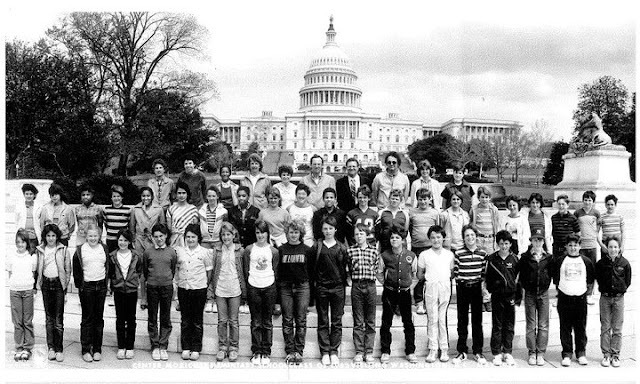 It's served in the dining room of the United States Senate every day, a tradition that dates back to the early 20th century. I remember reading about it when I was a whippersnapper and on my first trip to DC in 6th grade I got to try it. I wasn't impressed. Saute onions in a drizzle of olive oil till golden. 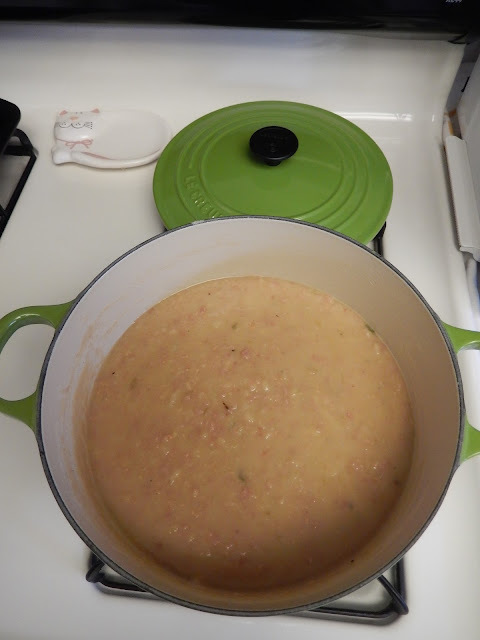 Add ham and seasonings and cook about 1 minute more. 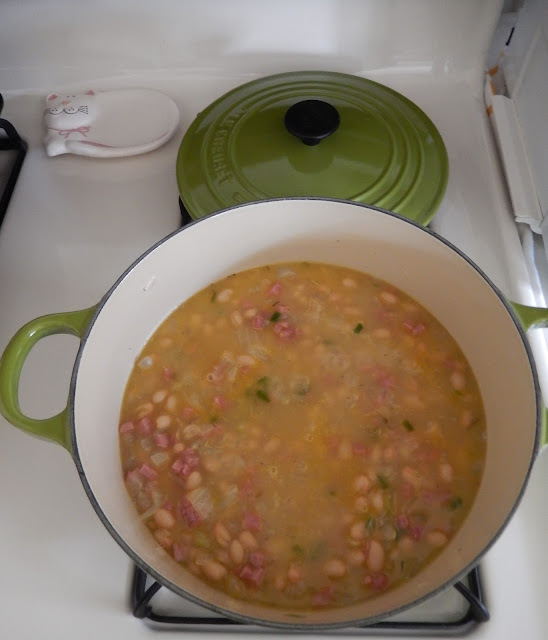 Add beans and broth and simmer for 20 minutes covered. Puree soup. A groovy gadget like this works great or you can do it in batches in a blender. Simmer 10 minutes longer. Serve with a shaving of Parmesan cheese. Looking forward to seeing everyone soon... and if you are not joining us this year... make these recipes, follow the tweets and make plans to come next year! You will be glad you did! 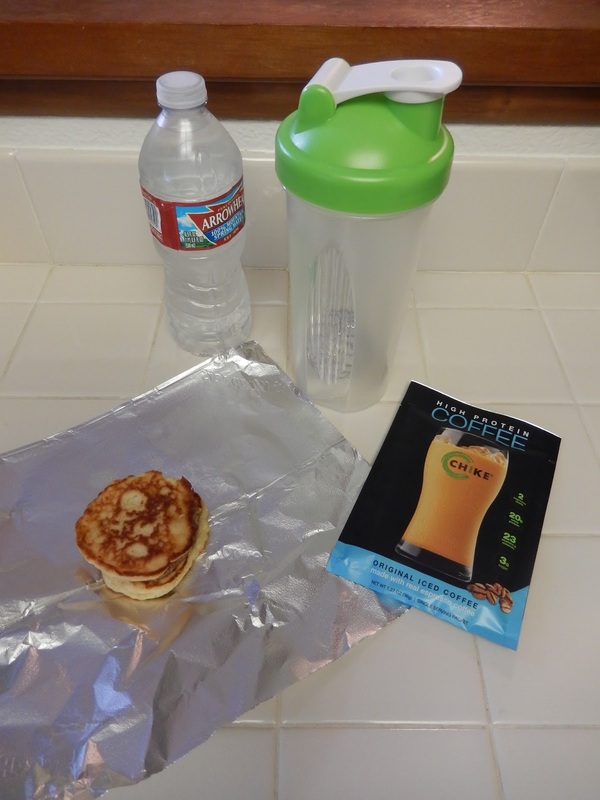 Breakfast: I had some early morning errands so I mixed up a Chike High Protein Iced Coffee packet in my blender bottle and wrapped up a couple of leftover Ricotta Pancakes that I smeared with a little almond butter and off I went. I had to laugh... a few minutes before I took off I was scrolling through twitter and clicked on a trending topic... those trending topics always make me question our values as humans... anyway... I clicked, I read about the latest Justin Bieber, Selena Gomez drama (hey at least it wasn't the Kardashians) and I tweeted this random comment. Of course, of all the tweets I post about things I ACTUALLY care about... my Bieber tweet went viral and by the time returned from errands I had hundreds of retweets and likes... my notifications blew up. It figures. Well I hope they scrolled down educated themselves about health and obesity issues a little ;) yeah doubt it too. 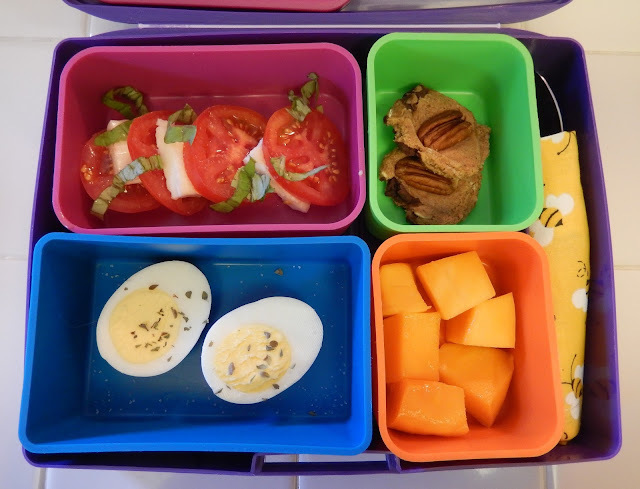 Lunch: When I got home I was sort of glued to my computer getting some of my to-do list done before I take off for the Your Weight Matters National Convention #YWM2016 next week. So I filled my bento box and ate at my desk. I have 17 things on my list currently. Yeah I know... "good luck with that." Green Box (top right): Oatmeal Chocolate Chip Quest Protein Bar "Cookies"
Dinner: I baked some Salmon fillets in the middle of the night last night. It was 105 yesterday (gonna be 101 today big cool down LOL) so when I woke up at 2 AM I sliced up a lemon and sprinkled some salmon with olive oil and a store bought herb blend. That's about the only time I'm OK with the oven being on. 25 minutes later I was back in bed for a bit with most of dinner done. 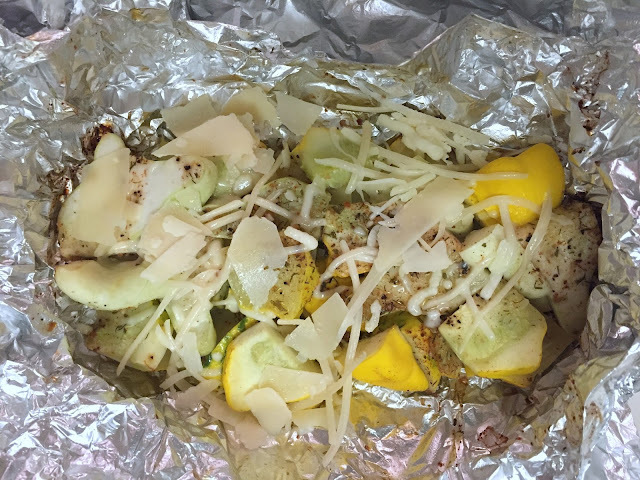 Just before dinner I tossed some foil packets of summer squash on the grill with the same treatment as the fish (drizzle of olive oil and sprinkle of seasoning blend) when they were done 20-25 minutes, closed grill. I opened the packed (careful for steam) and sprinkled some Parmesan and Mozzarella cheese on top. Snacks: Coffee in the morning. Sugar Free Raspberry Lemonade sticks the rest of the day. At the hottest part of the day I popped a couple of Greek Yogurt Cubes in my mouth. I always have a freezer bag of those in the summer. Just don't eat them too fast... brain freeze. Ouch. Chicken salad is a staple in my post-op world. 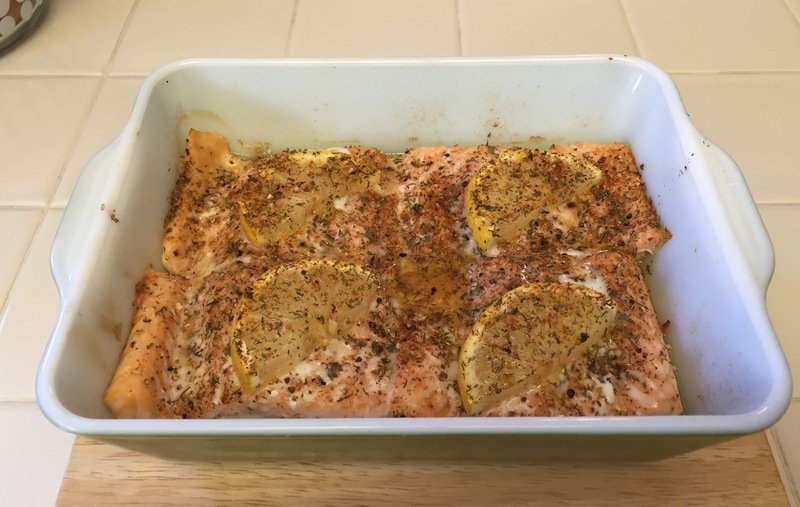 It's packed with protein and it's so versatile. Here's a great time saver I've been doing lately to make my life easier in the dog days of summer. I've been picking up a rotisserie chicken and using it to make a basic chicken salad base. 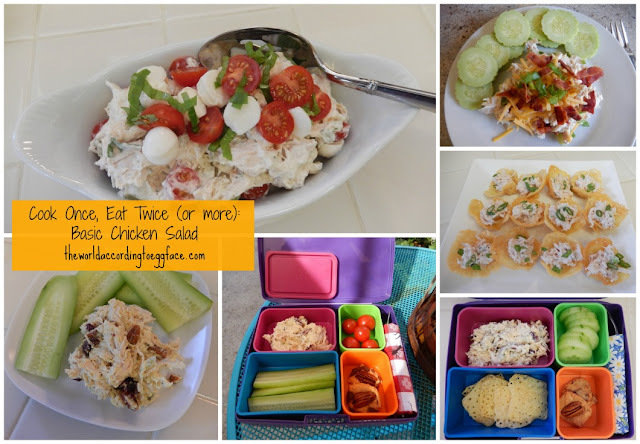 I divide that in half and with just a few additions that basic chicken salad base is transformed into two completely different tasting meals. Mix till well combined. Divide into 2 dishes, cover and refrigerate. When you are ready to have lunch or dinner. Grab one dish and your additions. Keeps several days in the fridge. Great to make on Sunday for lunches for the week. 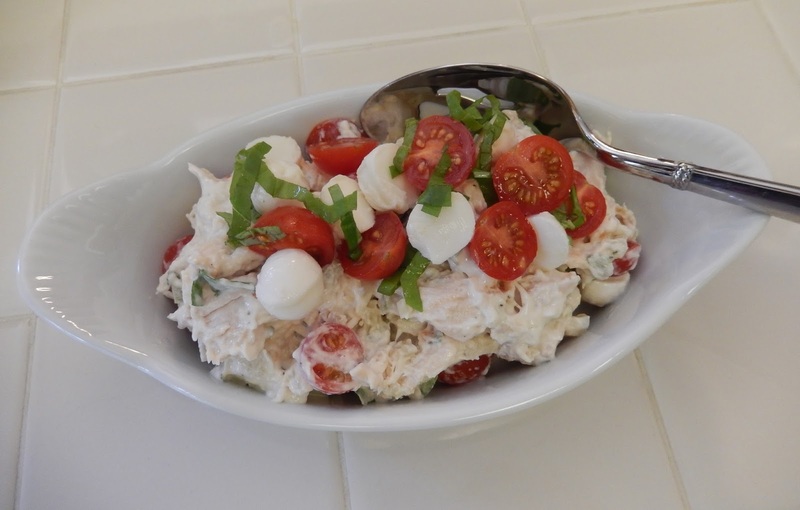 Today I made Caprese Chicken Salad: I added a 1/4 cup pearl-sized, fresh Mozzarella Balls, 1/4 cup Cherry Tomatoes, halved and 1 Tablespoon of chopped Basil. Yesterday I added 2 slices Bacon, crumbled, more diced Green Onions and 2 Tablespoons of shredded Cheddar Cheese for this "Loaded" Chicken Salad. Mexican Chicken Salad Additions: 2 Tablespoons Shredded Colby Jack Cheese, 1/4 cup Black Beans, rinsed and drained and Taco Seasoning, to taste. Curry Chicken Salad Additions: 2 Tablespoons Cashews or Pecans, 2 Tablespoons Cranberries or Golden Raisins and Curry Powder, to taste. 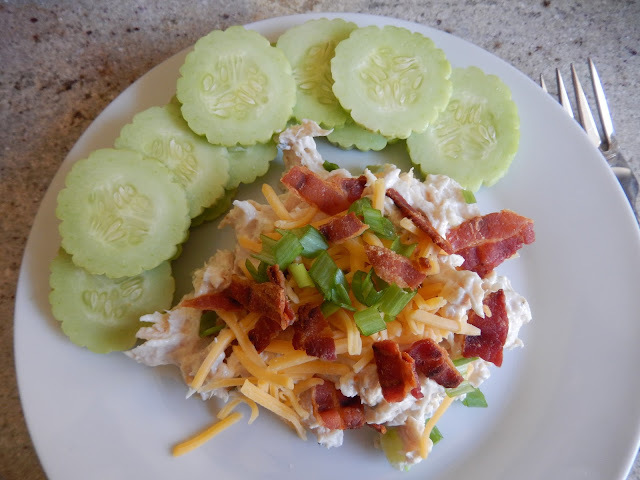 Asian Chicken Salad Additions: 2 Tablespoon slivered Almonds, 1/4 cup diced Cucumber, more Green Onion, and Chinese 5 Spice, to taste. Italian Chicken Salad Additions: 1/4 cup Roasted Peppers and Onions, chopped, 1/4 cup pearl-sized, fresh Mozzarella Balls, and Oregano, to taste. Eat as is, make a lettuce wrap or taco, cucumbers make great "crackers" or scoops or homemade Crunchy Cheese "crackers" or form them into cups and fill them. Breakfast: Happy Sunday Everyone! 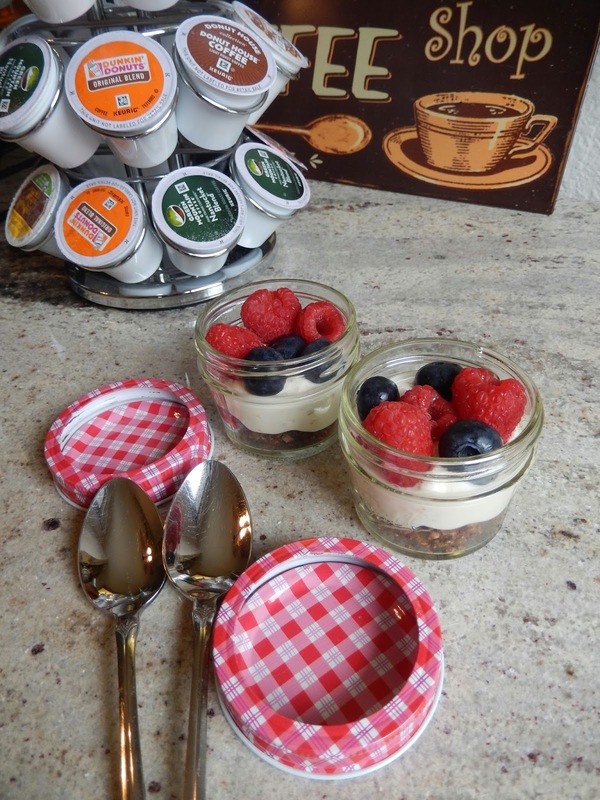 For breakfast I made Yogurt Parfaits. I made a batch of Protein Granola which was the bottom layer and topped that with Fig Yogurt and Fresh Raspberries and Blueberries that I picked up yesterday at the Farmer's Market. Lunch: I had phone meeting that sort of went into lunch (we're getting soooo close to the Your Weight Matters National Convention #YWM2016 Hope to see you there!) so when I got off the phone it was a bit too close to dinner to have what I planned so a protein shake to the rescue. 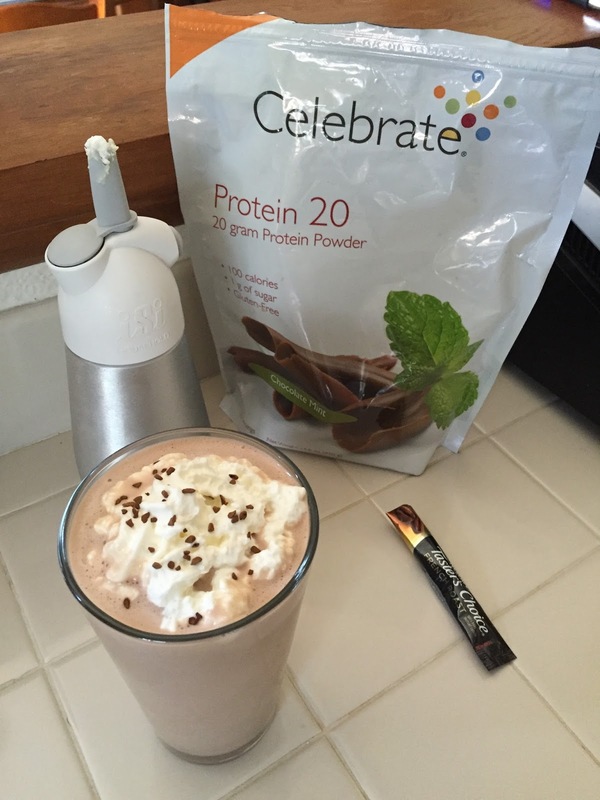 What a great combo this was Celebrate Vitamins (sponsor) Chocolate Mint Protein 20 and coffee. Blend on high till well combined. 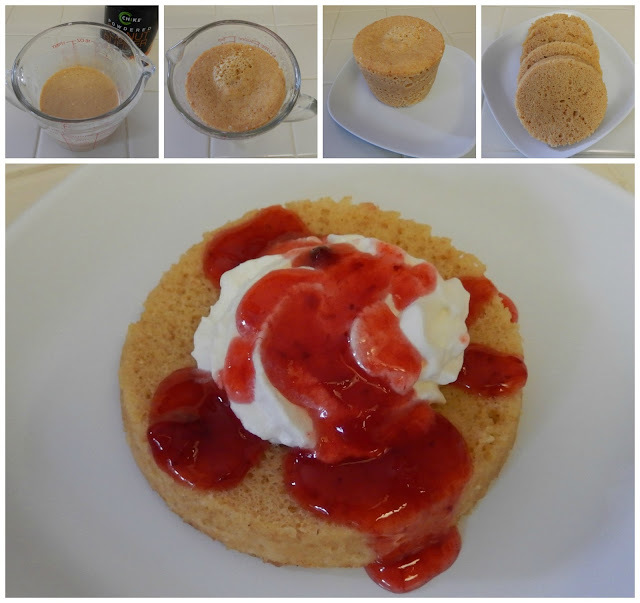 I topped it with No Sugar Added, Homemade Whipped Cream and sprinkle of instant coffee crystals. Yum! Dinner: This was sooo good. I was feeling like a burger and these little sliders hit the spot. I seasoned a 1/2 pound of ground beef (you can use turkey too) with some garlic powder, onion powder, salt and pepper and formed them into 4 little sliders and cooked them on my grill pan. In another pan I sauteed some onions, set those aside then sauteed some mushrooms. I had some pre-cooked bacon I just warmed in the pan to crisp it up. 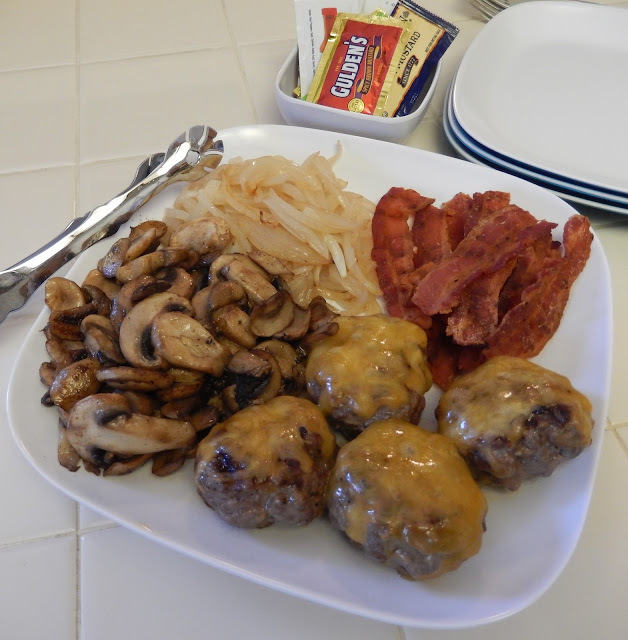 When the burgers were almost done I sprinkled some shredded cheddar cheese on each and placed them under the broiler to get all gooey and melty. Everyone makes their own cheeseburger slider creation. Snacks: Coffee. Tons of water with drink sticks. My new favorite: Raspberry Lemonade. Later there's a couple of Quest Bar turned into Oatmeal Chocolate Chip "Cookies" with my name on them. 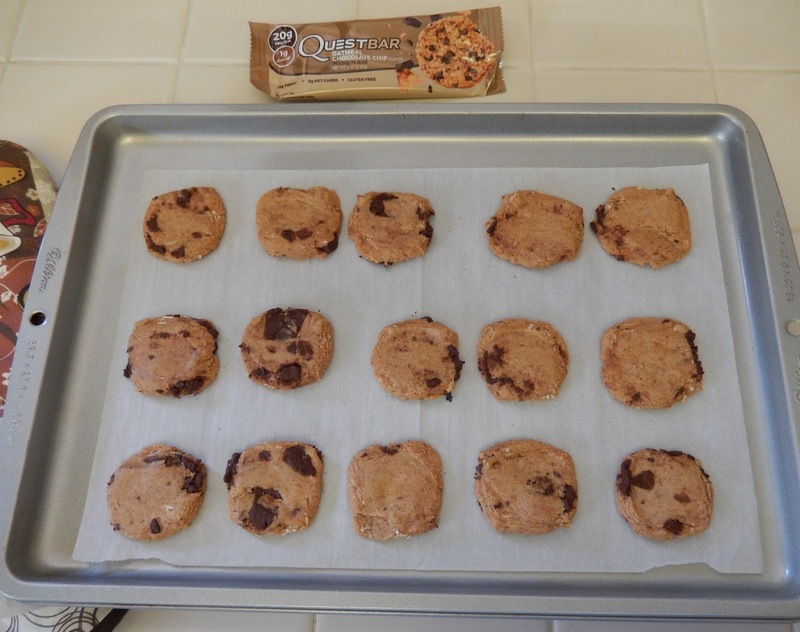 Oatmeal Chocolate Chip is the latest flavor Quest Bar. Keep your eye out for Blueberry Muffin and Rocky Road coming soon. Be sure to follow me on Instagram. Besides the typical photos and quotes. I host Instagram exclusive giveaways. 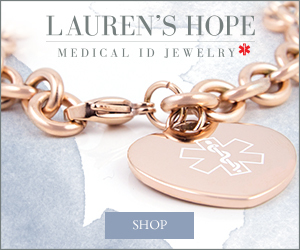 I call them Pop-up Giveaways because they pop-up when you least expect it and unlike my blog giveaways that usually last a week these pop-up giveaway are quick, you have a limited time to get in on the fun! To enter head over to Instagram and follow the instructions on how to enter. If you don't have an Instagram account... start one... or if Instagram not your cup of tea wait for the next blog giveaway coming soon. www.theworldaccordingtoeggface.com - You are here. www.pinterest.com/eggface - Oodles of recipes, organized by categories, always being added too. www.twitter.com/eggface - Current events, news and articles of interest in the weight loss, health, obesity, fitness, nutrition, food world and live tweeting from events. www.instagram.com/TheWorldAccordingtoEggface - Photos, Motivational Quotes, and Pop-Up Giveaways! This post is sponsored by Premier Protein®. I'm excited to share this great deal and some of my favorite Premier Protein recipes. 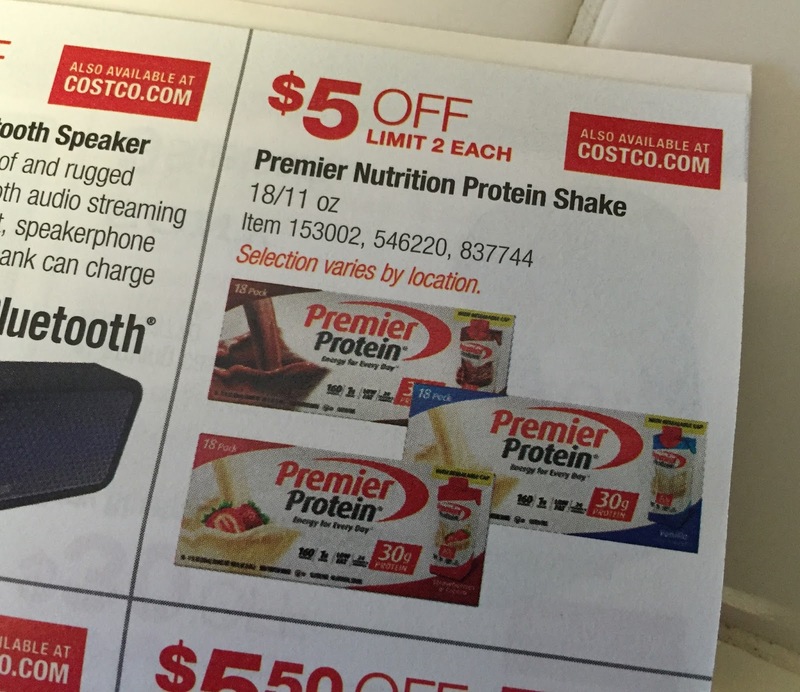 Heads up Premier Protein shake lovers: Score $5.00 off 18-pack shakes at Costco stores nationwide this August. From August 4th through August 23rd, Premier Protein’s 18-pack shakes will be discounted at $5.00 off. There is no coupon necessary it'll auto deduct the discount at the register when you checkout, limit 2 each, selection varies by location. 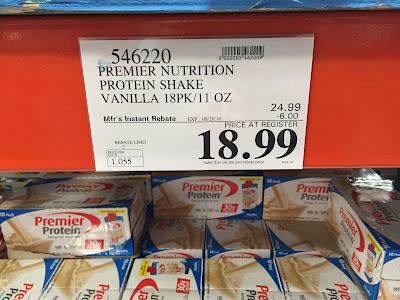 Costco already has an awesome deal on Premier Shakes so this is especially awesome and not to be missed. Premier Protein shakes are great when you need a protein-packed, grab and go breakfast or afternoon boost. This deal came at a great time. 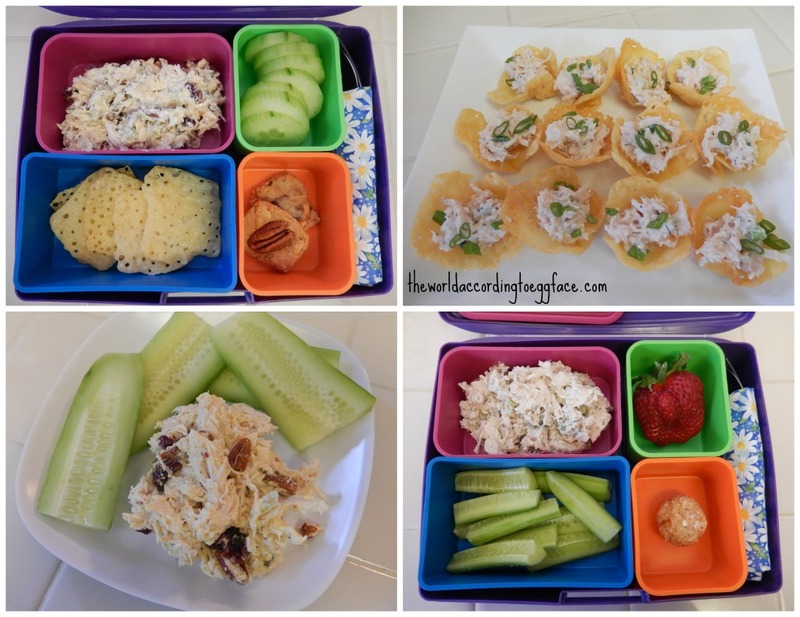 I can imagine in the next few weeks with school starting back my pals with kiddos may neglect their own nutritional needs in the hustle to get everyone out the door on time. 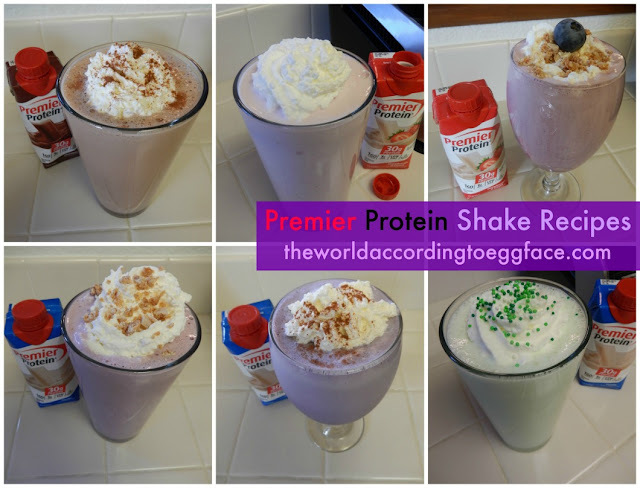 Premier Shakes are a perfect solution for you. Each 11 oz. Ready to Drink Shake has 30g of protein, just 160 calories and 1g of sugar. Toss a shake in your bag and you'll be sure of meeting your protein goals for the day. I hit up Costco this morning and mine actually had them on sale for $6 off! Chocolate, Vanilla & Strawberries and Cream. Blend on high till well combined. I topped it with No Sugar Added, Homemade Whipped Cream and another dash of Powdered Peanut Butter and a grating of Sugar Free Chocolate. Yum! 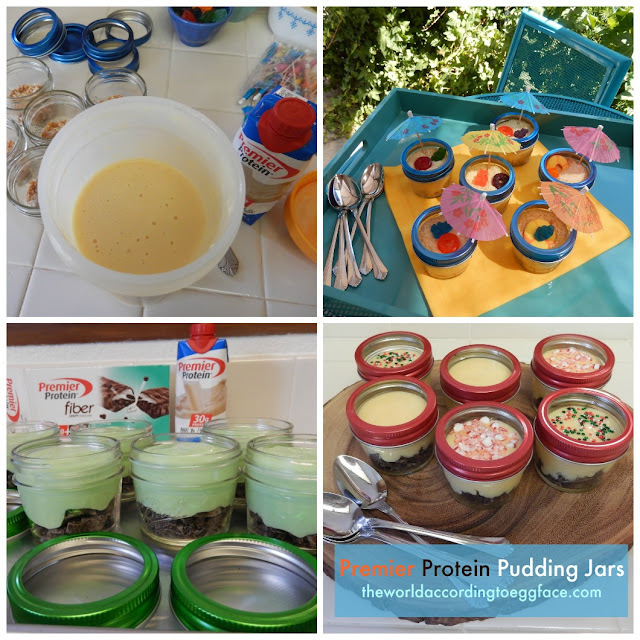 ...and a few shakes are destined to become my FAVORITE Premier Protein Pudding Jars. These are soooo good! 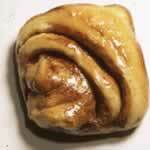 You have to make yourself a batch. They last several days in the fridge so they are great to make on the weekend and you'll have a protein packed treat whenever you want. This post is sponsored by Premier Protein. 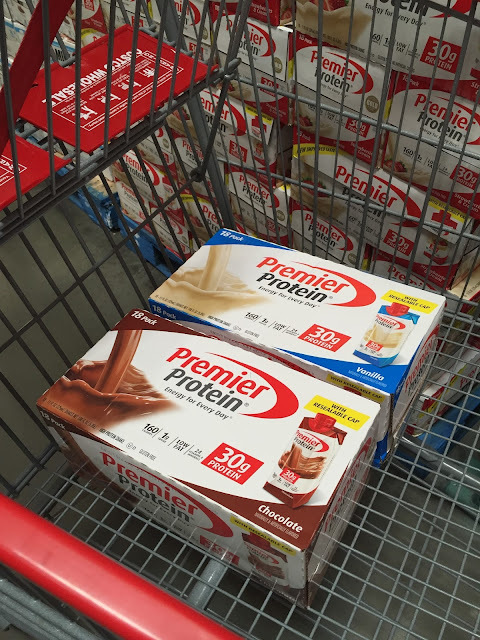 For the purposes of this post Premier Protein provided me with products used. 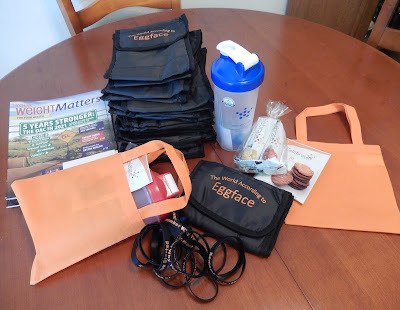 Want to learn more about Premier Protein products LIKE their Facebook page, Twitter and Instagram and tell them The World According to Eggface told you to stop by. 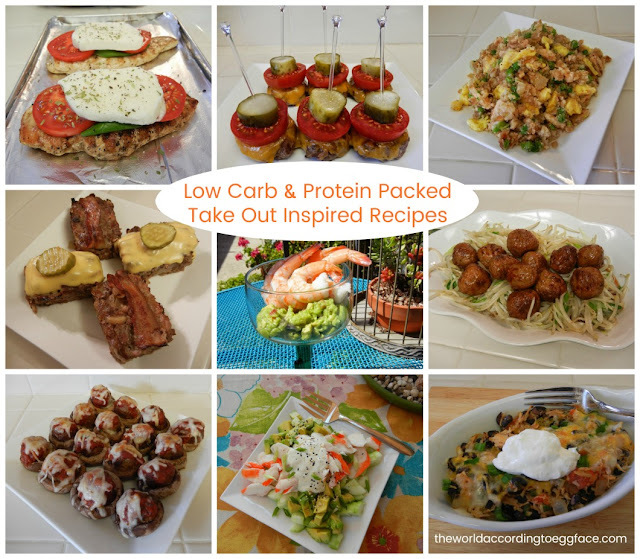 Hope you get in on the Costco deal and give some of my Premier Protein recipes a try. 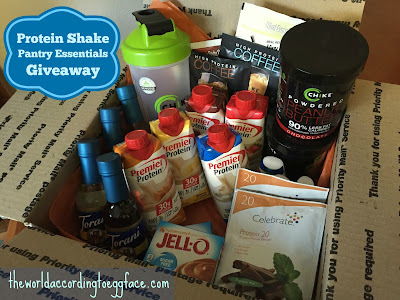 Thank you to all who entered The World According to Eggface Protein Shake Pantry Essentials Giveaway! 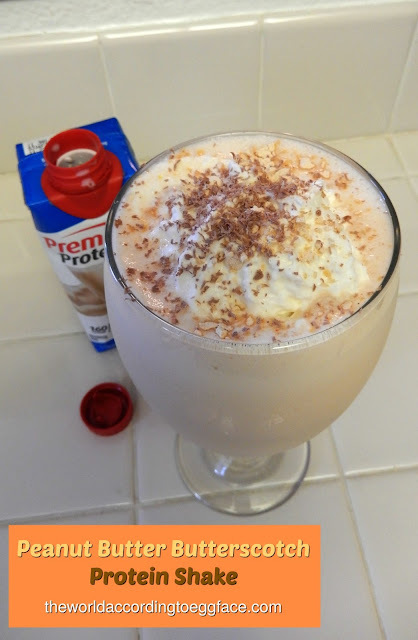 I loved all the ideas you shared for how you jazz up your protein shakes, I have a few new ones to try now. Thank you! Congratulations Wanda! You are the winner of the latest Eggface Giveaway! You win the BIG BOX of AWESOME filled with some of my favorite weight loss surgery friendly protein shake making products and supplies. You have mail! Want to learn more about any of the contents of the giveaway above: Click here for more info and sources. Not a winner this time... no worries another Eggface Giveaway will begin VERY soon! Follow along on the Blog, Twitter, Facebook, Pinterest, Instagram for the latest eggciting announcements and pop-up giveaways!